As society today becomes more unequal we seem to be moving back to a future which has much in common with the age of the aristocrat. the artisan and the peasant. When in Jerez for the Festival recently I went to two very interesting, but contrasting, eating places – the former homes of people set far apart on this antique social spectrum, ‘though not was all as you might expect. 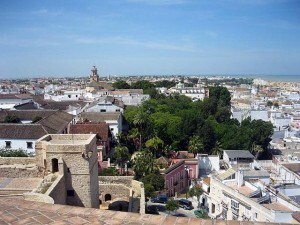 Both were in Sanlucar de Barrameda, a town in the ‘sherry triangle’ in Cadiz province. To the north of Jerez, Sanlucar lies on the estuary of the River Guadalquivir, as it meets the Atlantic. It’s an historic town and was the port from which Columbus’ third expedition to the New World set sail in 1498 and Magellan’s expedition eastwards in 1519. On the opposite side of the river, which you can cross by ferry but not with a car, is the Donana, a large nature reserve which is the last home to the Iberian lynx, the Imperial eagle and the Retuertas horse. The first of the historic hostelries can be found, tucked away high in the Barrio Alto, the old and crumbling section of the town. It is a mosto, the name also given to wine which has yet to be turned into sherry. Often to be found in the countryside, among the vineyards, mostos have been growing in popularity. Their food is basic and often caught on the land or fished (game in winter, fish in summer, traditional dishes all year round ), it is classic peasant cuisine and usually very tasty. 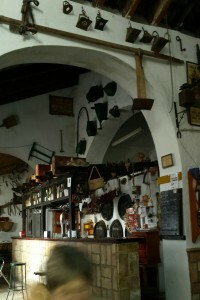 This mosto, called the Herreria, was in an old blacksmith’s forge. Inside, cloudy mosto was served from the barrel, though beer and other beverages were available and there was a range of small dishes prepared in the little kitchen behind the bar. The mosto slipped down very easily and the food was tasty, both were very cheap. But it was the place itself which was intriguing. It has been in the same family for several generations and run as a bar/eaterie ( I don’t know how far back we find the original blacksmith, but the current owner served us ). The small courtyard outside, complete with plastic chairs and coca cola sign, was being painted when we visited, so we were inside. All the better to look at the decorations. The walls are adorned with agricultural machinery and blacksmith’s tools, ancient posters, photographs and hunting trophies. Some of the posters went back to the 1950s. Down the hill a little, but still part of the high town, was the second historic building, where we went for coffee and dessert. 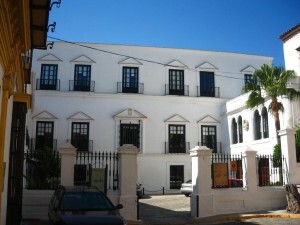 Formerly a ducal palace of the Dukes of Medina Sidonia, it now houses the archives of the family and their lands and is a hostel/hotel. 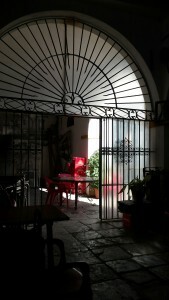 It also has a cafe and a very lovely and peaceful ‘English’ garden, with a terrace overlooking the Barrio Bajo below. The Medinas Sidonias are true-blue aristocrats, probably the oldest ‘Grandee’ family in Spain – the seventh Duke commanded the Armada which threatened England under Elizabeth I. The title continues today. But it was the 21st Duchess, Luisa (of too many names and titles to list here) who became popularly known, and loved, as the ‘Red Duchess’, for her strongly held socialist views and her, often illegal, attempts to alleviate the lot of the downtrodden. She spent quite a lot of the Francoist 1960s in prison. She lived and worked in the Palacio and died there in 2008. It is to her that the public owe their right of access. While we were in the garden a school party came in to look around. The cake was very good. So it’s possible to visit and eat and drink in the former homes of a socialist, twenty-first generation aristocrat and a third or fourth generation forge/bar owner. If you’re in Sanlucar you might like to do so. I can highly recommend both. I have a feeling I could come to enjoy the mosto, looking forward to visit in April. HIghly recommended indeed though ” mosto ” is better in september when they pick up the grapes in the vineyards, they press them and have the first results of the new wine. That´s the real one. All the mosto you have months later has been frozen and is being served cold as new one but it doesn´t taste the same… Not at all… It loses all the essence; a peculiar soft bitterness and harsh in your tongue. Have it with sea food and it´s a God´s delicacy. I agree. The Vendimia is the time for the mosto. But it is quite good at other times too.